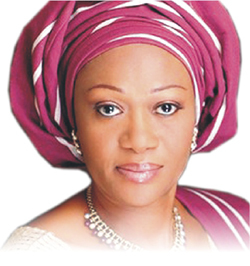 Oluremi Tinubu, the senator representing Lagos central at the national assembly, on Tuesday petitioned John Oyegun national chairman of the All Progressives Congress (APC), and Bukola Saraki, the senate president, over recent acts of “gross misconduct” by Dino Melaye, the senator representing Kogi west. In the letters, dated July 18, Tinubu explained that she was complaining to the leadership of the APC and senate about Melaye’s conduct at last Tuesday’s closed-door session, which she termed “improper” and “harmful”. “What took place at that session was nothing short of a threat of physical assault and abuse against me by senator Melaye,” she said. The senator said she hoped that the party would appropriately sanction Melaye for his “malignant” behaviour. She said on that basis, the party would affirm its policy of zero tolerance for gender discrimination and restore its reputation as the vehicle of change. Giving her own side to the story, Tinubu explained that she was recognised to speak after Melaye had “berated” some senators over their perceived roles in the judicial case involving the senate leadership. “I remained and attempted no interjection during the statement; senator Melaye tried to abridge my rights by hectoring at me and interrupting my contribution,” she said. She said Melaye charged at her in an effort to “physically” attack her. “The attack was only prevented by some respectful senators who moved to impede his path or otherwise block him from approaching me,” she added. “Senator Melaye hurled foul and vulgar language at me; what he said should never be heard in any public institution let alone the floor of the senate. She said it is of great concern that the senate leadership has been silent on the a matter as if it is condoning the “errant behaviour” of the senator. Tinubu said the party must ensure that its members know how to behave according to decorum, befitting their elected positions. Tinubu’s letters come one day after she wrote a letter to Ibrahim Idris, acting inspector-general of police, requesting police protection from Melaye, whom she described as a “threat to my life”. “During the proceedings of the senate on Tuesday, July 14 2016, I had cause to contribute to a matter of national importance,” she had said in that letter. “Apparently dissatisfied with my contributions, Senator Dino Melaye threw caution to the winds, resorted to vulgar abuse of my person and wanted to assault me. “It was the timely intervention of a number of colleagues which prevented Senator Melaye from unleashing physical attack on me. However, as the leadership of the senate did not call him to order in the circumstance, he proceeded to threaten my life without any provocation whatsoever. However, Melaye, the man at the centre of all the heat, has vowed never to apologise to Tinubu. During an executive session on Tuesday, the senate had urged Melaye to apologise to herin the spirit camaraderie, but he refused to do so saying, “great minds don’t dwell on issues; they act and move on”.